Calendarium - All about apps in YOUR classroom! That information alone would be enough to invest the money into this app. This may feel like an infomercial, but WAIT, THERE'S MORE!!! 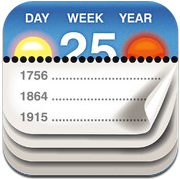 The dynamic and "must-have" feature of this app comes in the form of a list of all major (or minor) historical events that occurred on the current day. From there, the opportunities for classroom integration take flight. Don't just be content with historical facts from the last 300, 600, or 1000 years. There are facts going back as far as 200 BC or earlier. The best thing for teachers to do is to spend the money, download the app, and reap the benefits of something incredible. For ideas on how to integrate Calendarium with your classroom, follow us on Twitter or email us.